Proprietary Name: Ear Wax Removal Drops Equate What is the Proprietary Name? Non-Proprietary Name: Carbamide Peroxide - 6.5% What is the Non-Proprietary Name? 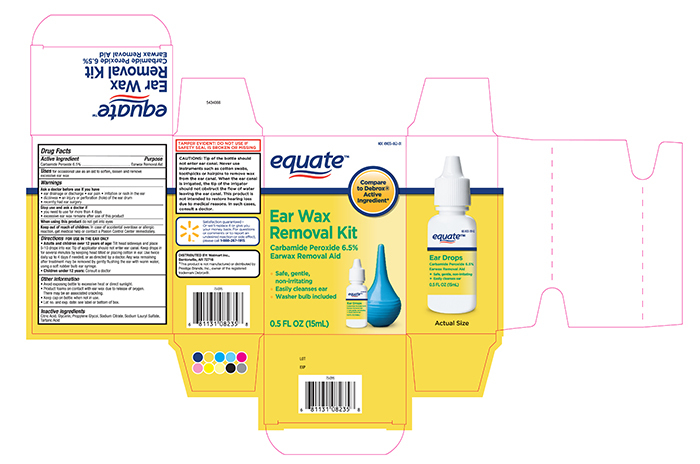 Ear Wax Removal Drops Equate with NDC 49035-862 is a a human over the counter drug product labeled by Walmart Stores Inc. The generic name of Ear Wax Removal Drops Equate is carbamide peroxide - 6.5%. The product's dosage form is solution/ drops and is administered via topical form. FDA Application Number: part344 What is the FDA Application Number? For occasional use as an aid to soften, loosen and remove excessive ear wax. 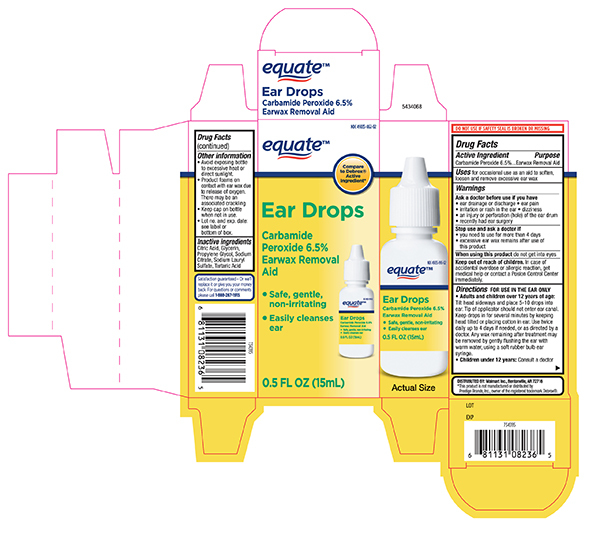 ﻿Adults and children over 12 years of age﻿: Tilt head sideways and place 5 to 10 drops into ear.Tip of applicator should not enter ear canal. Keep drops in ear for several minutes by keeping head tilted or placing cotton in the ear. Use twice daily for up to 4 days if needed, or as directed by a doctor. Any earwax remaining after treatment may be removed by gently flushing the ear with warm water, using a soft rubber bulb ear syringe.When the ear canal is irrigated, the tip of the ear syringe should not obstruct the flow of water leaving the ear canal.﻿Children under 12 years﻿: consult a doctor. Protect from heat and direct sunlight product foams on contact with ear wax due ot releae of oxygen, there may be associated crackingKeep cap on bottle when not in use.Lot No. and EXP date: see label, bottom container or box.